I love this quilt. The colors are beautiful! Very pretty. My husband even liked it. My bed is a queen but I did get a king size. I’m glad I did. 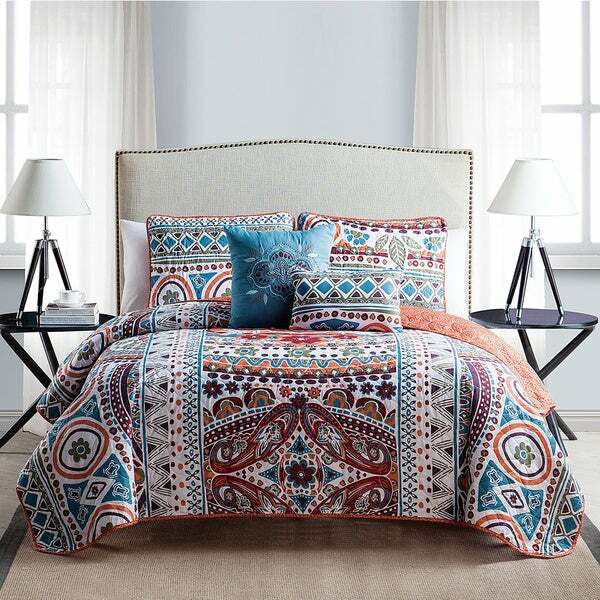 This quilt set combines a vibrant paisley print and geometric shapes and reverses to a coordinating solid brick red color for a rich, sophisticated look. 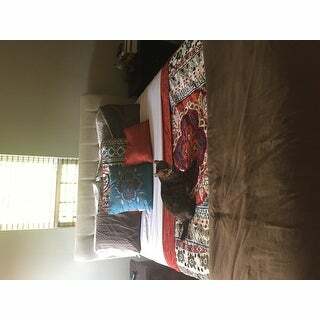 Quilt set comes with quilt and two pillow shams and two decorative pillows (one sham per Twin set). I love the bohemian look and bright colors to the set! I purchased a large for a queen sized bed because more quilt sets like these run small, this set is true to size and is too too big for my bed! Still beautiful and I still us it! The quilt set appears exactly as I expected. It’s full of vibrant colors and a great pattern! Love, Love, Love!!! The colors are vibrate and the pillows make all the difference!! I refuse to let anyone sit on my bed. Want to to last FOREVER!!!!!!! Looking for a quilt to use during the summer, my comforter is way too warm, this is perfect. Looks just as pictured, very pretty in person. Also, my cat likes it. Beautiful pattern, well made and the extra pillows made this a great buy! The colors are vivid but it is very attractive. We love it. Love the colors and the fit is excellent. Great fabric, soft and comfortable! Its was the right size and quality was great! The shade of blue matches my bedroom perfectly. I've been looking for a summer quilt. I hope this is the one.